The burning question: me or the pros? Even with the online website builders like Wix, Weebly, or Squarespace, creating a website takes a lot of one of life’s most valuable commodities – time. Plus, some of the features these drag-and-drop type website services offer are pretty limited. That’s not to say do-it-yourself website builders aren’t handy. They’re an excellent option for folks with low budgets or who need an online presence in a hurry. On the other hand, professional web designers are tuned in to all the latest trends, can help you easily track analytics data, and know how to make Google happy. An experienced web designer will typically register your domain and host your website for you and can create something completely custom and user-friendly. So, between creating a website yourself with a website builder or hiring a professional, what is the better choice for you and your needs? We’ll break down each option in more detail. 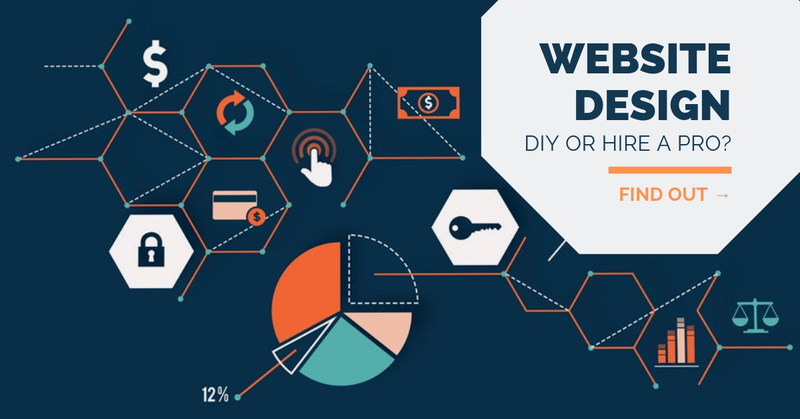 Do it yourself websites: do you have what it takes? There’s one crucial question you should ask yourself before diving into your web design project: “How valuable is my time?” You will need to invest A LOT of working hours before pushing the ‘publish’ button. The folks at Web Create say, “You need to prioritize your time for planning, building and QAing the site as well as content development,” on top of your other day-to-day tasks. It’s important to note that creating a website is not just a one-and-done type job. To use an adorable analogy, a website is like a puppy. Instead of kibble, you have to continuously feed your website fresh and engaging content. Instead of dog training, you have to keep your site optimized and up to par with the latest Google algorithms and SEO tactics. If you have the patience, time, and dedication to train a puppy, then you should have no problem building your own website. Read on for the tips!